Are you a graduate student, post-doctoral fellow or early career faculty member involved in precision medicine research? Here’s a great opportunity to earn a scholarship and present your research and learn about ways to integrate promising new genomic therapies into patient care. Hear from leading experts in individualized medicine, including Euan Ashley, M.R.C.P., D.Phil., Stanford University; Kathy Hudson, Ph.D., National Institutes of Health, and Mark Caulfield, FMedSci., Genomics England. As a scholarship recipient, you will have the opportunity to listen to Kathy Giusti, founder of the Multiple Myeloma Research Foundation, discuss the future of precision oncology and the role of the patient. Learn about home DNA collection kits from LeRoy Hood, M.D., Ph.D., president and co-founder, Systems Biology. Apply now for the Early Career Investigators in Precision Medicine Scholarship Program to attend Individualizing Medicine 2016: Advancing Care Through Genomics – a national conference focused on how to translate the promise of genomics into clinical practice, sponsored by the Mayo Clinic Center for Individualized Medicine. Learn from expert speakers, focused breakout sessions and poster sessions. Discuss the latest in consumer genomics and home-based DNA collection kits. Conference breakout sessions and case studies will explore research and its application to every day care in areas such as epigenomics, the microbiome, biomarker discovery and more. Experts in the field will be on hand to share their insights and experience. It will be a great chance to network with leaders from around the world in the fields of precision medicine, genomic research and health care delivery. 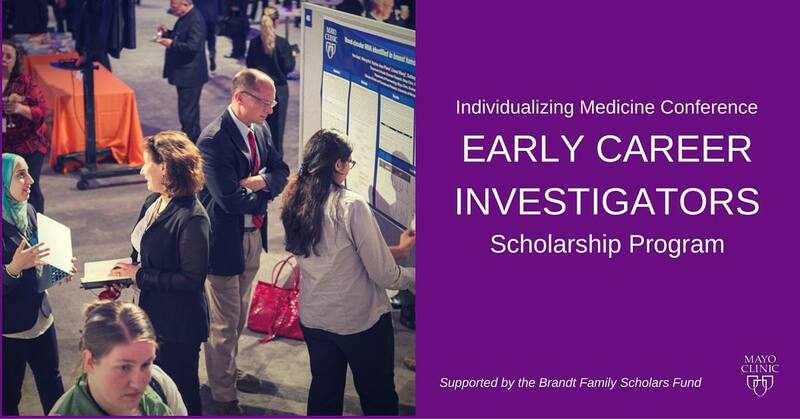 The Early Career Investigators in Precision Medicine Scholarship Program, supported by the Brandt Family Scholars Fund, was created to encourage and support early career investigators involved in individualized medicine research. Present their research in the Early Career Investigators in Precision Medicine Concurrent Session at the conference. Receive a Scholarship Poster Award. Enjoy complimentary conference registration to attend all conference sessions. Receive support to assist with travel and lodging expenses. The deadline to apply is August 5. Student or post-doctoral student of the Carl R. Woese Institute for Genomic Biology. Research interest in individualized medicine.